Over the Christmas break, my oldest was home from college and the whole family was back together again. For many years when the kids were younger, we strived to have dinner together almost every night. But now that there are older, one is away to college, one has a job and another has frequent basketball practice, so dinner with all six of us is fairly uncommon. That is until holidays roll around. The dynamic, energy and overall excitement around the table definitely amps up. Although my wife and I struggle to understand the various meme references or quotes from YouTube ‘stars’ we’ve never heard of. Quick side (or indented) note – up until 18 months ago, I had never heard of the word “meme” but my kids use it all of the time. Curious, I looked up meme’s origin and found it was coined by an evolutionary biologist, Richard Dawkins, in 1976 to describe how ideas replicate similar to an organism [reference: http://mentalfloss.com/article/61843/what-origin-word-meme]. So it’s been around a long time, and ironically its growth in use is actually the perfect example of what a meme is! Now, back to the action. Post evening meal, my kids all retired to the basement to play some multi-person video games from their recent Christmas haul. There had been a time when I did Dance Dance Revolution with them (sorry I just created that mental picture for you) but my overall skills in video games in general have dramatically dropped off since playing the original Tomb Raider PC games years ago. Undaunted I joined them in the basement and asked to play. Turns out playing Super Mario 3D World was not so much fun for me. Not only did I have no idea what I was doing, but I frequently lost track of my character and more often than not I either fell off, jumped off, or was picked up and thrown off a ledge. Death comes swiftly and frequently in Mario land. I was frustrated, didn’t know what I was doing, felt stupid because I wasn’t catching on and if I’m being honest, I was feeling left out from the fun everyone else was clearly enjoying. Things changed when I asked if maybe there was a game that required cooperation to get tasks done versus all out competition. And frankly, I needed someone to take the time and teach me. Enter the game Donkey Kong Tropical Freeze and lessons from my youngest son. Turns out I died just as often as I did before, maybe even more often, but it was an entirely different experience now. I learned each time what did and did not work in the game, especially as my son taught me when to shake the nunchuck, how to jump and climb the vines and most important, how to time my jumps. Each new experience was just at the edge of my ability and sometimes I succeeded and other times I didn’t but I always learned and progressed forward. Now I was having fun and the time was screaming by. So what does Donkey Kong have to do with loving the job you have? Turns out there are key neuroscience lessons from this experience that can be leveraged in the world outside of video games. My experience with video games is not unique and has been studied extensively. “Making a prediction is one of the most reliable and efficient ways to prime and stoke the reward circuitry of the brain. “Every prediction you make—no matter how trivial—increases the level of the dopamine in your brain,” says neuroscientist Dr. Judy Willis. How can you leverage the power of prediction at work? It’s actually quite easy since a lot of our work experiences tend to tread fairly familiar ground each day supplying us all with ample opportunities to predict what our experiences will be like. We all have co-workers and someone usually talks about the weather or is late to a meeting or receives a package and so on. We also have a daily commute, frequent meetings, ‘talks about empowerment’, lists of corporate buzzwords (the endless search for synergy and game changing opportunities), such that one can almost predict who might say what in various settings. So the easiest way to leverage prediction is make a list of the different work related experiences you might have in a day and see how many you get correct. Whether your predictions are positive or negative, you’ll get a jolt of dopamine each time. Looking for something more fun than a simple list? More to come after secret #2. I’ve always wondered how musicians feel when their songs born from personal hardship end up being used in cheesy commercials. Back in the 70s, Carly Simon wrote a heartfelt ballad about what the future held for her and her partner, and the importance of savoring the now. That same song, Anticipation, became even more popular after being forever fused and associated with Heinz Ketchup. Fast forward to now. Researchers have extensively studied the effects of anticipation and what it does to our brains. In one experiment, participants were asked to rate their feelings about future and past events [reference: http://psych.colorado.edu/~vanboven/VanBoven/Publications_files/vanbovenashworth2007.pdf]. It seems we consistently rate the anticipation or looking forward to an event higher and more intensely than past events we have actually experienced. In fact, most of our pleasure comes from the anticipation versus the actual event itself. Furthermore, different types of events impact the intensity of anticipation as well. Ninety-seven participants were asked to rate an upcoming experiential or a material purchase (e.g., experiential could be going to a concert, out to dinner etc. versus material would be buying an item like a purse, clothing, and so on). Their anticipation was rated on ‘excitement’ and ‘pleasantness’ scales [reference: http://journals.sagepub.com/doi/full/10.1177/0956797614546556]. They found that anticipating experiential events is more exciting and pleasant than material purchases. Combining prediction and anticipation at work will increase your overall job satisfaction. Each day, there should be at least one activity or event that you are positively anticipating – it could be a new assignment, completing a particular task, learning something new but it must be something specific to that day. And doesn’t even have to be strictly work task related, it could be taking a coffee break, having lunch with or taking a walk with a friend, whatever. It just needs to be something you know you will look forward to. A lot of people make their next day’s to-do list at the end of the day. If you are one of them, take a few moments to make sure you plan in an activity you will look forward to. I’ve given you a few ideas above, but for those of you looking for a ready-made activity that is simple, fun and leverages the science of both Prediction and Anticipation, here it is – Office Bingo! I’ve borrowed this concept from a story shared in the book SuperBetter referenced earlier. In the book, McGonigal describes a friend who knew he was going to be having a challenging job interview and to prepare, he created a bingo card of all of the different questions he predicted he might be asked. The next day during the interview, each time he was asked a question that he predicted, he mentally checked it off and turned what could have been an uncomfortable situation into a dopamine charged game not to mention being better prepared for the interview. 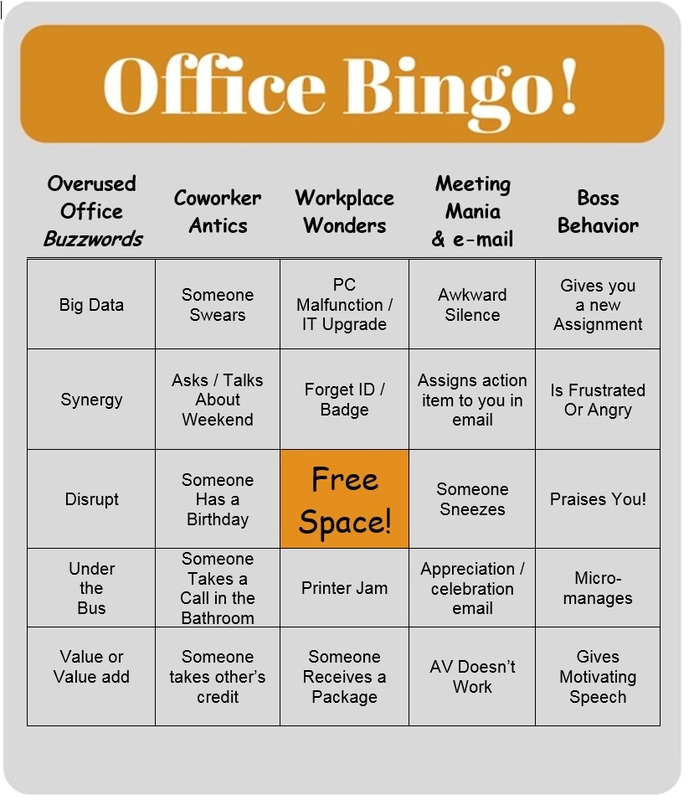 Below are two “Office Bingo” cards. 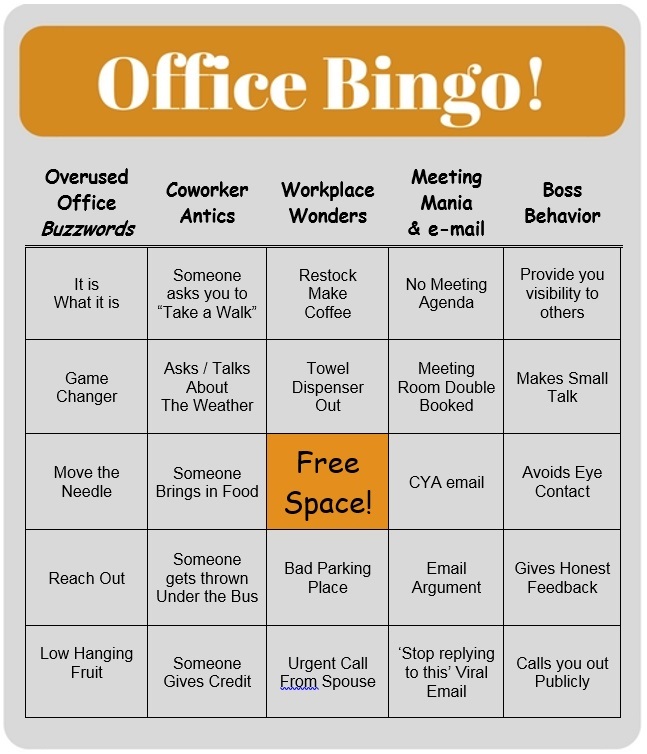 There are numerous ways to use the Office Bingo cards. Some ideas to get you started are listed below. Solo Prediction Game: The first is to ‘play’ on your own by choosing one card and, similar to the interview situation above, predict at the beginning of the day the items you are likely to encounter. At the end of the day, see how many you got correct and the next day see if you can increase your score. Solo Bingo: In this game, you play a more traditional Bingo game and simply fill the card in throughout the day to try to get a Bingo. Try different Bingo games – down, across, diagonal, postage stamp, four corners, etc. Partner Prediction Game: Enlist a partner in crime and have each of you choose a card. Play the prediction game above by having each of you predict the items on your own cards you believe you will encounter. The winner is the one with the most predictions correct that day. Partner Bingo: Play a normal Bingo game versus your partner and see who can get a Bingo first. The different options have varying degrees of anticipation and prediction built into them. Experiment with these and other options you come up with on our own. As you use these cards, you’ll soon find other non-Bingo ways to use Prediction and Anticipation and Love the Job You Have! Want to know if it is ever a good idea to Fake It? Check out this post ! 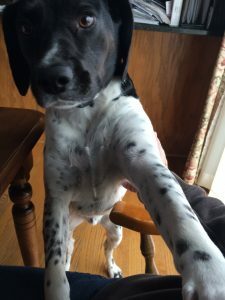 During the holiday break, my kids were home from school and our family dog, used to being mostly alone during the day, was now in the company of all of us for more than a week and his tail was wagging like crazy wondering who of the six of us would play with him or take him for a “W”. Quick side note: I can’t say the word ‘walk’ otherwise the dog will hear and immediately run to the door and whimper ready to go out and see the sites of the neighborhood. Once that switch is turned on there is no turning it off. So please, when you come over, make sure and use the code letter “W” when referring to this activity. While you would think with so many of us in the house, there would be plenty of attention to go around. However, for that day after gift opening, there were many other distractions – laptops, new video games, tablets, etc. and the dog, well, he wasn’t getting quite the attention I think he thought he might get. He would go grab his treat holder or his rope or some other toy and prance (yes, I used the word prance, I’ve never really seen a dog do this before) into the room and lay the toy by one of us, nudge us with his nose, and if that didn’t work a bark or two would get us looking his way. Reluctantly, one of the kids would grab the end of a rope and start to ‘play’ with the dog. I put the word ‘play’ in quotes because while they would do tug of war, throw the rope, and so on, they weren’t really engaged in the activity. Usually a phone or other electronic device was holding their attention and the dog and rope play was really just a perfunctory act. They wouldn’t look at the dog, be excited and really interact other than pulling on the rope and throwing it without any enthusiasm while looking at their phone. Finally, only a couple of throws into the ‘play’, the dog just left the rope on the floor, ambled over to the corner of the room behind a chair with his head and ears hung low. There, he laid down and let out a big sigh. Ironically, as I write this article, he came over to play (see photo!). And yes, I took a break from the computer to play with him. I think you all see where this is going. Being really engaged, really present, and really authentic makes all of the difference. My dog knew that my kids really didn’t want to play and so he just gave up. Similarly, as humans we can tell when someone is not being authentic with us as well, and we certainly read a lot about authentic relationships, leadership and such. But here is where some research may surprise you and certainly shocked the scientists who studied it. Scientists at the School of Psychology at Cardiff University and the School of Humanities and Social Sciences at Jacobs University, Bremen, conducted two experiments on trustworthiness (Kumbhuber, Eva “Facial Dynamics as Indicators of Trustworthiness and Cooperative Behavior”, Emotion 2007, Vol. &, No. 4, 730-735). Participants in the study played a “Trust Game” where they were given a set amount of money. They could then choose to give this money to a counterpart who could get even more money and share it with the original participant or the counterpart could keep everything. Participants were told ahead of time that some of their counterparts were trustworthy and others were not. So if they choose an untrustworthy counterpart and shared their money, they could be left with nothing. Therefore, they could choose not to engage the counterpart at all and just keep their original amount. The only information the participants were given about their counterparts was a picture of them. Depending on the experimental condition, the participants saw one of three videos of their counterparts – one where their counterparts had a neutral facial expression, one with a true or real smile, and one with a fake smile. Similar to my dog story earlier, participants were able to see differences between real or fake smiles and found those with real smiles more trustworthy and they were more likely to engage them in the experiment than those counterparts with fake smiles. However, what they also found was that participants found those with a neutral expression to be least trustworthy, even compared to those with a fake smile who would be thought to potentially be the most likely to be duplicitous and deceitful. In fact, the participants found those with a fake smile to be more likable, attractive, along with being trustworthy than the counterparts with neutral expressions. In the second experiment, they would also be more likely to meet the fake “smilers” in real life. It is true, that authentic smiles were the best in every category, but the fakers made out better than no expression at all even though participants could tell the difference between real and fake smiles. What this means for us is even if you aren’t feeling it, sometimes even a fake smile is better than no smile at all and even a fake smile has a halo effect on a number of perceptions others have of you. And, oddly enough, faking a smile more often than not eventually translates into true positive feelings and the fake smile converts to a real one. Manoush Zomorodi news anchor and author of Camera Ready, has an informative video about what she calls “The Benign Smile” which can help you move from a neutral face to one that is more engaging on its way to being authentic. Finally, one caution and that is real vs. fake smiles don’t seem to have the same effect if you are communicating over the phone – check out the post “One Awesome Nonverbal Phone Tip” for more on this phenomenon. When I was growing up, we didn’t have cable. In fact, I think we were only able to watch the three network channels and occasionally PBS if we lined up the giant antenna on our roof in just the right direction. Fortunately, the networks had just enough shows to keep me entertained during the summer months and my favorite shows were Lost in Space and and Match Game hosted by Gene Rayburn. Looking back and now being able to rewatch some of those Match Game episodes on YouTube thanks to The Game Shown Network, I realize I missed most of the adult humor, but I remember laughing a lot mostly because everyone on the show was having such a good time. For some reason, my favorite episodes were those at the end of the year where Gene and ‘the cast’ would ceremoniously change out the Match Game sign (if you are feeling nostalgic, check out this clip from New Year’s Eve 1974). Recently and quite by accident while flipping through the hundreds of channels I now have on Comcast, I saw Alec Baldwin in a reincarnated version of my beloved childhood show. I watched when I realized one of the celebrity panelists was Sarah Palin (okay, I didn’t see that coming). What I also learned quickly is this version’s adult humor is a lot less subtle and as others have described somewhat raunchy. So I was wondering how this was possibly going to work between Baldwin and Palin and the general tenor of the show. The audience laughter and quick nodding and writing of the celebrity panel indicated there was an obvious and correct answer. Contestant 1’s answer – “underwear”. The audience summarily booed her and the celebrities hung their heads. One after the other, they turned around their cards almost all having a variation of an answer involving Wonder Woman’s chest (fill in PG rated words to get the true answers they gave). Almost all had this answer except for one celebrity. I didn’t finish the episode but I did think about the important lesson in communication this game and other game shows like Password and Pyramid teach us about communication. I talk, teach, and write frequently on the use of nonverbals in communication and the power they have to enhance or detract from our messages. Unfortunately, many times when learning about body language, people assume there are ‘right’ or ‘wrong’ nonverbals and they don’t take into account context and the person they are communicating with. Researchers at Columbia and Michigan State conducted a study where they showed a ‘persuasive’ video individually to ninety students about a new after-school assistance program [reference]. Students were randomized to watch one of two videos. In both videos, the words used, the script, was identical. The only difference was the presenter’s body language – in one video, their body language was “eager” and in the other “vigilant”. Most body language articles and courses teach that an “open hand” stance like that in the “Eager” example is more inviting and therefore preferred. However, what Cesario and Higgins found in their study is depending on the students (those watching the videos) goal orientation (whether the student was ‘wired’ to work toward or away from something) the type of nonverbal used had significant impact on the student’s receptivity to the video’s message. [For more details on goal orientation and ‘regulatory fit’, see the end of this article]. In fact what worked well for one orientation was the exact opposite for the other. There was no universally effective nonverbal. So what does all of this mean and what do Match Game and Sarah Palin teach us? It means there is no ‘right’ or ‘wrong’ nonverbal skill, it all depends on connecting with people where they are, not where you are. The motherly prim and proper contestant on Match Game was not going to give the raunchy answer most of the other celebrities gave, that wasn’t where she was coming from. Sarah Pain made a match because she was already in the same frame of mind as the contestant. To really communicate and connect with someone and meet them where they are, you have stop thinking about your message and what you are trying to say, and take in all of not just their words, but what the other person is doing and saying when they are expressing different emotions. Do they raise their voice, lean in, talk faster, use their hands, flash their eyebrows, tap their feet, flare their nostrils, breath faster… you get the idea. The key is to pay close attention, listen, and watch. If you are truly doing this and putting them first, your own physiology and brain waves will start to sync with them. This will create something frequently referred to as mirroring. Your Key to building rapport and a strong connection is to first feel that connection yourself. If you aren’t feeling it, they aren’t feeling it. Fronting: To start, you want to give the other person your complete attention. Start by fronting the other person, that is, squaring your body so you are directly facing them. They need to literally be the center of your universe. Eye Contact: A funny thing about eye-contact, too little and you will seem tentative and too much you might seem creepy. Go for the middle ground. This not only demonstrates your interest level in the other person through your undivided attention, but according to Dr. Kerstin Uväs-Moberg in his book The Oxytocin Factor, making eye contact releases Oxytocin, the hormone that creates those warm feelings we feel when making a close connection. Triple Nod: The triple nod does two important things. First, research shows when you do the triple nod, the other person will speak 3 to 4 times longer making them feel listened to and important. And second, when you nod, you are basically agreeing with what the other person is saying and this builds what scientists call a “yes set”. It is like when a salesperson asks you a couple of simple questions like “Is it still June?”, or “It sure is warm today isn’t it?” you say yes (even if only in your mind) and research shows once you start saying yes, the more likely it is you will continue to do so. Yes sets build connections. So when you nod, you build your own yes set and further strengthen the connection you are making. Pretend, then stop pretending: At this point, you are fronting the person, making appropriate eye contact and using your triple nod. Likely you are already feeling a very strong connection, but to fully complete it, use the power of your imagination. Do this by pretending the person you are with is the most interesting person you have ever met. Really imagine it and act accordingly. Then stop pretending. These steps will help you build amazing connections and meet people where they are. As a bonus, the next time you are sharing the stage with Alex Baldwin, you have the knowledge to go all the way to the final Match Game! How much money would you spend on a pair of earbuds? $25.00? $100.00? How about a pair that runs $14,995?! There’s good news if you have that kind of money to spare. Beverly Hills artist Hugh Power runs the House of Gold and is dubbed the “real life Midas.” He can turn anything you might want into gold… but at a price. What’s that? You don’t have that kind of cash? That’s okay. Even if you don’t have tens or hundreds of thousands of dollars, you too can have the Midas Touch. Okay, maybe it won’t transform objects into gold, but it can transform your power to connect and influence. For the rest of this article, please check out its original post on The Science of People! This guest post is by Todd A. Fonseca, a twenty-year medical device executive, published author, columnist, international speaker and Science of People Certified Body Language Trainer specializing in developing leaders at all levels. You can follow him on Twitter and along with countless others, take advantage of the free content he offers on his website. In May of 2013, Malaysian Male Model Chee Yu Sam, also known as Sam Insanity , posted a YouTube video in response to a challenge Ellen Degeneres gave to her audience. Ellen asked viewers to record themselves secretly mirroring others and then post their videos online. Not one to shy away from the camera, Sam took to his hometown streets of Kuala Lumpur and snuck up behind or beside people and mirrored their actions while his buddy captured it all on camera. He sat next to a businessman who was having coffee and mirrored drinking one of his own even though he didn’t have a cup. He crawled on the ground below a girl sitting on the edge of a fountain and mirrored her checking out her cell phone. He blanketed the city capturing these and other moments and his final video, complete with a soundtrack consisting of ‘Paint my love’ by Michael Learns to Rock, is funny, which is exactly why Ellen put forth the challenge. But as Sam points out, people he mirrored didn’t always think so. In fact, a number of his victims looked like they wanted to beat him up! Please see the rest of the article at my guest post at The Science of People! Recently I was discussing with a colleague the importance of developing and maintaining a network at work. While she said she agreed, her body language said otherwise. After a moment, she confided that others had told her that networking was just “kissing a**” [imagine bleep out tone here] and they would have no part of it. If you think networking is just for getting yourself ahead or sucking up to others and being smarmy or worse both of these things, then don’t do it. You will be transparent, seen as insincere, selfish and yes, you’ll be puckering up just as my colleague warned. But this is not networking at work, at least not the way I recommend you approach it. Once while standing near a well, Leonardo da Vinci saw a pebble strike the water. At that very same moment, a bell rang in a nearby church tower. As da Vinci watched the concentric circles travel outward from where the pebble had hit the water, the ringing sound of the bell echoed in the valley. At that moment, Leonardo’s mind connected the unconnected as Michael Michalko describes in his book Cracking Creativity, The Secrets of Creative Genius, and discovered that sound travels in waves just like the ripples on the water. In similar fashion, Joannes Gutenburg connected the unconnected back in the 1400s by combining the mechanisms from wine pressing and punching coins to create movable type ushering in the printing press. Like da Vinci and Gutenburg, countless others have made novel combinations connecting divergent concepts resulting in incredible innovations. Had da Vinci not seen the rock splash into the water at the same time the bell rang or Guteburg not experienced both wine pressing and coin punching, would they have still have had their insights? It is impossible to know, but certainly these experiences served as catalysts for their discoveries. What does this have to do with networking at work? Networking is your way to create catalysts for connecting the unconnected. Not to benefit yourself, but to benefit others and your business. For example, I was in a meeting a few weeks ago where the presenter was discussing how their team had revolutionized the way we manage our websites. They described how what had previously taken months to get new sites up and running now took days with both higher quality and less money. The remaining issue they faced was finding a way to quickly translate these new sites to serve our global audience in an efficient and cost effective manner. I happen to know from another group I work with that creates our international technical manuals that this translation problem had already been solved. By bringing these two teams together we were able to solve the website teams’ remaining issue. This is a simple example, but you can appreciate the potential impact you can make by being the one to connect the unconnected. When you spend time networking, you meet with a divergent set of people throughout your organization. Your job is not to sell them on you. Your job is to take the time to understand them, their work, their frustrations, and their goals. The hope is that at some point you might be able to help some of the people in your network with their goals either directly or by connecting them with others in the organization. To do networking the right way, it is about creating relationships at work where your focus is on giving and providing value to others. Honoree describes in her book how to view your network as you would any other relationship. You are not simply creating a one-time transactional interaction (e.g., a one night stand!) but a long term relationship built on trust. You will connect more or less frequently with different people in your network depending on the circumstances. How do you decide what type and frequency of interaction is right? Fortunately, Honoree has the answer. Even better, it is free! Her trade marked 12×12 system for managing your network can be found at http://honoreecorder.com/resources/. This is a step by step system that walks you through how to identify, organize, discover, and connect with your network. It is written as if you are running a business but the principles and the tool are equally effective for establishing and nurturing your network at work. The Referral Institute conducted research analyzing data from over 12,000 entrepreneurs and found the most successful of them spent 6.3 hours per week networking. Furthermore, 47% of their subsequent business came from this networking. Wow – half of their success was from networking. For your network at work, I recommend not 6 hours per week, but 6 network connections per month. Also, your network should follow the 33% rule. That is, 33% of your network should be in with your peer group, 33% should be with those that work for you (if you are a manager) or are ‘lower’ in your company hierarchy, and the final 33% should be with those colleagues at higher levels in the organization. You will then be connecting with two people in each of the three groups each month. Do this each month, time and time again, and watch your network grow. If you view networking at work as connecting the unconnected, treat your network as a set of long term relationships, and devote time to developing, maintaining and finding ways to give to your network, you will be amazed at the impact you will have. Get More Done – Two Ways You Can Blast Through Procrastination! As humans we have an amazing ability to separate ourselves from others, especially in uncomfortable or disturbing situations. Take the homeless person on the street holding the “Need Money for Food” sign. I’m betting on at least one occasion you distanced yourself from them, looked straight ahead, and perhaps even ignored them. It is this same capability that is at the root of procrastination. Our ability to distance and separate from others is also alive and well within ourselves – our future selves. UCLA Psychologist Hal Hershfield has conducted research where volunteers were asked a series of questions while their brain activity was evaluated under fMRI (functional magnetic resonance imaging). The questions involved asking the volunteers about themselves, about other people, and finally about about themselves in the future. fMRI results showed similar brain activity when volunteers answered questions about their future selves and when answering questions about others. The only time there were differences in their brain scans is when they answered questions about themselves in the present moment. At Princeton University, psychologist Emily Pronin studied this effect even further by telling volunteers that they were testing people’s reactions to a rather disgusting concoction of liquids they would be made to drink. Furthermore, they were also told that the validity of the tests improved the more the person drank. The volunteers were then split into three groups – the first choose how much they themselves would drink then and there, the second would choose how much others would have to drink, and the third group would choose how much they would have to drink when they returned to finish the experiment in two weeks. Again, there were no differences between the “future selves” and the other people results. Only when they had to drink immediately was the amount significantly less. Our brains simply categorized our future selves as a different person. This is one reason difficult tasks are pushed off to the future. Afterall we don’t have to deal with the task – our future self does. Academics call this temporal discounting – or the tendency to value immediate needs as higher than future needs. Would you prefer a chocolate-chip cookie or a radish? Which would be harder to avoid eating if given a choice? Psychologist Roy F. Baumeister from Florida State University decided to find out. Telling volunteers who had been asked to skip a meal before their testing that they were participating in a taste test, Baumeister separated them into three groups. One group was asked to sit at a table with two plates in front of them – one with freshly baked chocolate-chip cookies and the other with a bowl of radishes. The volunteers could only eat the radishes and were asked to fill out a form about how they tasted. A second group had the same two choices but could only eat the chocolate-chip cookies. The last group was not subjected to any food and answered questions about their mood. Finally all groups went on to a second phase where they were asked to spend time working on a puzzle. Unfortunately none of them knew the puzzle was not solvable. What was being tested was how long the members of the different groups would work on the puzzle. The chocolate-chip and mood groups were essentially the same, 19 and 20 minutes. The group that ate the radishes and avoided the cookies, however, gave up in only 8 minutes. Less than half the time of the other groups! This was because they had depleted their willpower by avoiding the cookies. As a result, they had less in reserve to work on the puzzle task and gave up much sooner. Studies have repeatedly demonstrated this effect. It is why if you are on a diet and are “good all day” you are more likely to fail late at night if temptation is in the house. Your willpower is gone. When it comes to doing tasks we don’t want to do, we are considerably more likely to procrastinate doing them if we have already used our allotment of willpower for the day. Great, now you know some of the problems and what can cause procrastination. But how can you combat your brain’s wiring and still get things done? Have you ever driven home from work and when you arrived you had no idea how you got home? Perhaps your mind was wandering around on all sorts of thoughts and it felt as if someone else drove you home? That is because driving has become a habit. Your subconscious does it for you. It takes no effort because it has become rote. The beauty of rote behavior is it takes absolutely no willpower. It just happens. In his book, Mini Habits: Smaller Habits, Bigger Results, Stephen Guise describes the research on this phenomenon and shows how to leverage it to your advantage. Using exercise as an example, he suggests instead of setting big goals each day – like working out for an hour – do the opposite. Set outrageously easy goals that take no effort or will at all to accomplish. Like one jumping jack. That’s it, just the one. That’s the goal. The key is to have something so simple that you expend no mental energy or willpower to make it happen. The magic is what happens next. Once you do one jumping jack, you cross the activation step. This is usually the hardest part. But deciding to do only one jumping jack takes no will power. What follows in your mind goes something like this: Well, I’ve already done one, I might as well keep going. The next thing you know you have done a few minutes of jumping jacks and likely work out for even more time. The secret is setting the outrageously easy goal you can’t not do. The bonus outcome is doing much more with no expense of additional willpower. The power of mini-habits is the first step. Use it with the next step and blast through activities you might have otherwise procrastinated on. If you are like most people, you have a to-do list. Maybe you have items listed on post-it notes, a piece of paper, your computer, or maybe you use one of the many apps with prioritization categories, calendar reminders and the like. These are all fine tools for collecting and maybe even categorizing the various things you have to do, but they are also great at creating anxiety – documenting all the work you have in front of you. Depending on each item’s complexity, different levels of willpower are needed to get them started. This is why most experts advise you to do your most impactful and sometimes hardest tasks at the beginning of the day when you have your greatest stores of willpower and energy. That’s good advice and leverages some of the things you have learned above. But it also means the rest of your day is blown if you tackle a big willpower task at the outset. There is better way. One that allows you to do any number of big tasks throughout the entire day without depleting your energy. The secret is in how you frame your to-do list. Remember it is the starting of an activity that takes up the energy. But once you start it takes little more willpower to keep going. Just like the jumping jack example above, once we start, we have momentum that carries us forward. So for each task on your list, write two or three really simple get started actions. One runner I know has his easy start task as put on running shoes and shorts. Nothing about running 3 miles, just the easy actions that get the process going. Putting on shoes is easy and takes no energy but once you have them on you resign yourself to the running and it is much easier to complete. Viola!Add one or two simple actions for each of the items on your to-do list. 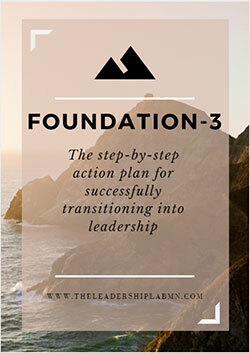 The added benefit is that by capturing the actual steps you need to take, it releases the background garbage that usually runs in your mind about the task and the steps you need to take to accomplish it. Writing these simple steps gets the task out of your mind and reduces stress. By taking advantage of the way your brain is wired through the use of mini-habits and simple action steps, you can complete amazing amounts of challenging work without depleting any of your willpower, saving it for those unexpected times and emergencies when you really need it. Creating a positive self-sustaining environment is not about special surveys, programs or big organizational events that take considerable time, effort, and expense. In fact it is just the opposite. Let’s turn to an analog in the annals of big city management. “Broken Windows Theory” is frequently discussed by urban leaders when revitalizing their communities. The theory’s premise is that by focusing on simple, visible, everyday crimes like graffiti and toll jumping – the so called “broken windows” – an overall atmosphere is created that is intolerant of crime and promotes positive social behavior. Many credit the turnaround of New York City in the 1990s to Rudy Giuliani’s implementation of this theory while he was mayor. As a leader, you can implement your version of the broken windows theory to create a positive self-sustaining and supportive environment by similarly focusing on two small and visible everyday actions that add up to big cultural change. In the 1960s, researcher Stanley Milgram recruited a few hundred people in Nebraska and had them each send a letter to a Boston businessman. None of them knew the businessman directly but they were instructed to send their letters to people they did know and who they thought might be more likely to know the Boston native. For example, they might send their letter to a friend or relative who lived on the east coast. Once that friend or relative received the letter, they were instructed to forward the letter to someone they knew who they thought might know the businessman. This continued until the letter reached its final destination. The result was, on average, it took 6 transfers of the letter to complete its journey. In other words, each person in Nebraska was connected to the Boston businessman through only six degrees of separation. In 2002, this experiment was repeated globally and included over 90,000 people. The result was the same. Each global connection was made on average through 6 steps. It’s hard to imagine, but all of us are essentially connected to one another through just six connections. And while we are all only 6 degrees from one another, in their book Connected, authors Nicholas Christakis and James Fowler report on research that demonstrates our actions influence and ripple through 3 of these 6 degrees – that what we do affects our direct connections (one degree), our connections’ connections (two degrees) and our connections’ connections’ connections (three degrees). We have an amazing exponential impact. Jane Warren in the Journal of Neuroscience conducted an experiment where participants listened to different recordings, some of happy positive emotions like laughter and amusement while others were negative like fear and disgust. The participants’ brains were evaluated by an MRI while they listened and researchers found that the areas of the brain that became active during these tests perfectly mirrored those that activate while directly experiencing the emotions. This means simply hearing someone experience an emotion creates the same emotional response in our brains. Similar research shows the same effect when we see an emotion like when someone cries. This is our mirror neurons at work and they are the basis for something called emotional contagion. Richard Boyatzis has published extensively on emotional contagion and what he refers to as “Resonant Leaders”. These leaders are “authentic, transparent, genuine, and act with integrity”. After being around resonant leaders, people feel energized and inspired. Combining your three degrees of influence with the knowledge of mirror neurons leads us to two simple but powerful daily actions. As we get older, naturally and through socialization we become less expressive. Research shows that upon entering school as children we demonstrate more than 400 hundred expressions but once we leave high school we show less than 100. The unfortunate side effect is our ability to connect and inspire is handicapped. In his “Still Face Experiment”, University of Massachusetts’ professor, Edward Tronick, made video recordings of parents interacting with their children – talking, playing, and laughing and so on. At one point in the experiment, the parents were asked to freeze their face. Almost immediately the children reacted, initially confused, the children made whatever attempts they could to get a reaction from their parents. When nothing worked, the children became more and more upset, cycling through multiple attempts to get any type of parental facial feedback. Hormone testing confirmed the children’s cortisol stress levels increased along with their heart rates. All of this just from parents freezing their facial response to their children. How many times have you walked down the hall at work so wrapped up in your thoughts that you completely miss or ignore the people around you? In meetings, are you really present? When you are mentally checked out in these situations, you either have no facial expression or worse you might be expressing whatever thoughts you are having at the time. If you are frustrated, this translates like wildfire to those around you and others in their network. Follow the sage advice a mentor of mine once gave me – “pretend the person you are with is the most interesting person you have ever met; then stop pretending, and they will be”. Harvard’s Amy Cuddy calls this “fake it until you become it.” As a result, your complete focus on them will transform your non-verbals, and your face will come to life. Your blank distracted stares will be replaced by engaged warm expressions. The person you are talking to will unconsciously mirror your expressions and because of the facial feedback hypothesis, they will feel what you are feeling and a positive connection will be made. This connection becomes self-sustaining by transferring to the next people you both interact with. Every interaction you have is an opportunity to inspire others. How you respond to another person’s good news is the key in doing exactly this. University of California psychologist Shelly Gable and her colleagues have extensively studied how we respond to good news. Of the four possible responses you could make, surprisingly only one is generative. For example, say your employee has secured a contract in record time – you could respond in one of four ways. Instead of responding to your employee’s work on the contract, you completely ignore it saying, “Are you ready for tomorrow’s presentation?” Gable’s research shows ignoring the news is the most destructive response. Before you conclude that you would never do this – consider all of those good news emails you get from people in your organization. Are you responding or just deleting them? And even if you are responding, are you doing so appropriately? What is appropriate? Keep reading. “Wow, I’m surprised that contract went through since our position was really weak. They must not have been paying much attention”. In this response, you don’t ignore the news but you attribute success to something or someone other than your employee. You just completely undervalued their contribution. Again, you might think you would never be this blatant but you’ll see in the next response you don’t have to be to be just as harmful. “That’s great” or “congratulations”. On the surface these responses seem acceptable. They’re not. It turns out these passively supportive comments are just as harmful as the blatantly negative responses. Surprised? Take a moment and think about a time when you were especially excited about an accomplishment and someone gave you a quick “that’s great” or “congratulations”. How did you feel? Did it build you up or were you a little deflated after their perfunctory comment? “Congratulations! I know you worked hard on getting the contract language exactly right. Using our past experience with that vendor made all the difference. This success will convert into a lot of incremental sales for the quarter. Really strong work.” This engaged response is where the magic happens and helps build and sustain your employee’s enthusiasm as well as their connection with you. As a leader, your attitudes and actions affect not just your employees, but their colleagues and their colleagues’ colleagues. You go viral every day. Be present in every interaction and when you respond do so with genuine enthusiasm and watch your culture transform. There are research proven techniques to help maximize your first impression. I will assume that the standard proper dress, grooming and research about the company/position have already been done or understood by you. In this first section, I will focus on those subtle non-verbal actions that form a subconscious connection and increase your charisma. Amy Cuddy from Harvard University has done extensive research on the effects of High and Low Power posing and its psychological as well as physiological effects. She found that if participants do a High Power Pose for a few minutes prior to interviews, that those candidates were found by assessors to be more confident, have greater presence and overall more likely to be hired versus those who did Low Power posing. 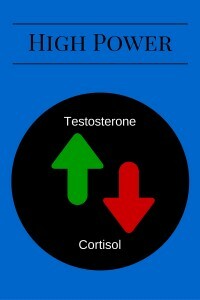 Subsequent research on this showed that those who High Power posed actually increased their level of Testosterone (a confidence building hormone) and lowered their Cortisol (a stress hormone). High Power posers also felt more confident and took 86% more risks compared to Low Power posers when they were asked to gamble after holding these poses. Turns out evolution has wired us to immediately check out others to see if they are friend or foe. This helped in caveman times to see if others wished to do you harm. Subconsciously, our minds check two things immediately – hands and face/smile. The smile is the one expression that can be seen and recognized from 300 feet away. True smiles are in the eyes, and create wrinkles or crows feet versus a fake smile which is easily recognizable. They are hard to fake but if you want to practice put a pencil between your teeth and bite down. The cheek muscles naturally rise similar to a real smile; notice how this feels and remember to smile this way when you enter (just forget the pencil). Hands are also key because our subconscious looks to see what we have in them (back to cavemen who were looking for weapons or something being held in the hands that could do us harm). So keep your hands open and inviting. That is, no tight fists. Keep them relaxed. Once you sit down make sure they remain visible keeping them above a table and not underneath. Studies with jurors found that they believed defendants who kept their hands under the table to be more untrustworthy and were subsequently more likely to find them guilty. Three keys before you even speak are the Handshake, the Nod, and Eye Contact. Haptics is the fancy word for touch, but it is key in forging and maintaining relationships. When we have skin to skin contact through touch, the brain releases Oxytocin, the “connection”, “cuddle”, or “love” hormone. Research shows that a good hand shake can create the same bound relative to Oxytocin as a 3 hour face to face meeting. The keys to a good handshake? 1. Firmness – not too firm, not to limp. Impossible to describe so grab some friends who will be honest with you and test your handshake firmness with them. 2. Vertical – Keep the handshake up and down. Don’t turn your wrist over the top of the person you are shaking hands with and don’t let them turn your wrist under. This is a dominance move and you want a level playing field to start the relationship. 3. Dry – No sweaty palms. When you are doing that power pose in the bathroom, dry those hands off. There is some interesting research showing that those who give a slight/subtle nod appear more credible. In the 1960 presidential debate, those who watched it believed Kennedy won the debate while those who listened thought Nixon won. The video below starts at the place where Nixon and Kennedy give nods to the audience. Watch and see the difference and have your nod be more subtle and confident like Kennedy’s. ontact while shaking hands and using the Nod. If you employ the High Power pose prior to your interview, instill trust subconsciously through your hands and smile, have an appropriate handshake with a Nod and good eye contact, you will maximize your first impression and in so doing put yourself in a strong position when interviewing. Identical twins interview for a job. They wear the same clothes. They say exactly the same words. They interview with the same people. They match their mannerisms to be as much the same as possible. But one of the twins gets offered the job 80% of the time over the other twin. It may seem odd, but word order makes all the difference. Starting positively sets the tone. It is the anchor all subsequent comments are judged from and what we know from brain research, once an anchor is formed, it is extremely hard to move away from it. Bernieri et. al. found that whether it be 20 seconds or 20 minutes, those who watched videos of interview candidates came to the same conclusion on who they would hire. So a successful interview starts way before you walk through the door with no only preparation but all the nonverbal queues you send before those first words come out of your mouth. When you do speak, make sure to set a positive tone. Putting these together will result in differentiating you from your competition.